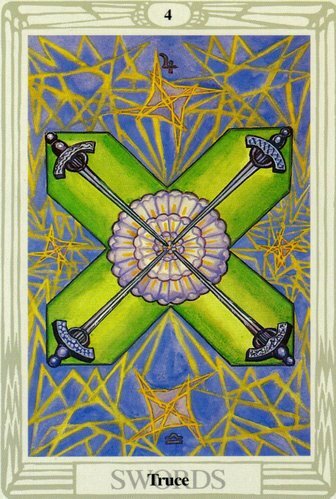 In this version, Four Swords are perfectly balanced from the outer corners of the card to the center where they meet in the middle of a rose blossom. They are untouched and unaffected by the images of chaos and turbulence behind them. This is the essence of the Four of Swords, which is represented in this deck by Jupiter in Libra — the planet of expansion in the sign of peace, balance and harmony. Keep this image in your thoughts today while you go about your routine. No matter what happens around you, you’ll be one step ahead of the game as long as you remain centered and refuse to be affected by external distractions and frustrations. The card used for today’s tarotscope is the Thoth Tarot by Aleister Crowley illustrated by Lady Frieda Harris, distributed by U.S. Games, inc. This deck is also available as an app for Android devices.